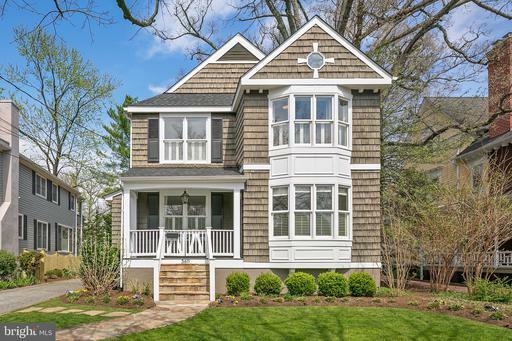 Welcome home to Chevy Chase Village!! 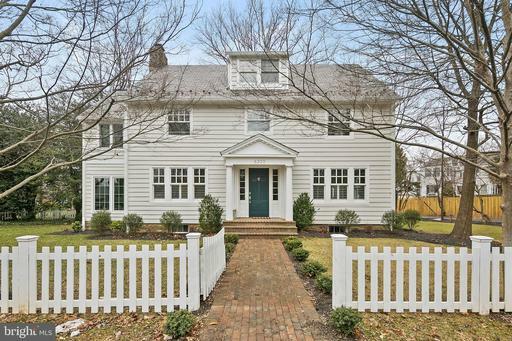 This stunning full renovation colonial mixes modern updates, luxury finishes, and comfortable living spaces- making you want to move in tomorrow! Walking in, you will see the gorgeous hardwood floors, expansive windows, and the spacious living areas. The house is flooded with natural light, and each room allows you to entertain, lounge, and live comfortably with your friends and family. The gourmet chefs kitchen is outfitted with three ovens, a turnkey island, and premier appliances, as well as a butlers pantry or mudroom! Each bedroom is sundrenched with tons of space. The Owners Suite has a custom walk-in closet, as well as an ensuite spa-like bathroom, adorned with double vanities, a soaking tub, and heated floors. The finished lower level is an incredible bonus space with endless possibilities- another family room, place to host, and more! Finally, the large fenced-in corner lot perfects this opportunity- complete with a flagstone patio, a fully landscaped yard and 4-car parking! New price!!! LUXURY PENTHOUSE UNIT with amazing view! 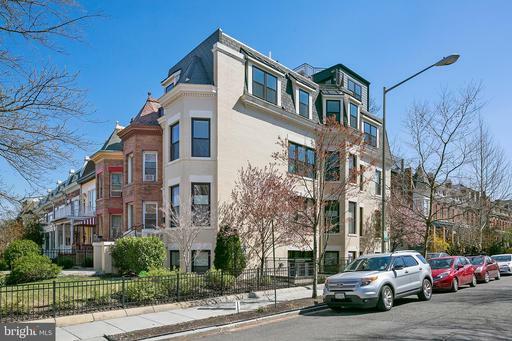 3BR/3.5BA- live in the middle of U St, 14th St Meridian Hill Park! Three levels of living with a PRIVATE ROOF DECK and contemporary finishes throughout. Living area with floor to ceiling windows oak flooring in French gray. Sleek kitchen with table space white marble counters. Luxe owners suite with ensuite BA double vanities. The roof deck is incredible- with DC city views and an expansive space to entertain, lounge, and more! Secure parking completes this amazing opportunity! Welcome to 3611 Thornapple Street, ideally located on one of the most charming and desirable streets in the neighborhood. This gorgeous porch-front home is outfitted with exceptional details throughout, including a new roof, new appliances, and more that allows this home to be an opportunity that cannot be missed. From the outside alone, you will see the beautiful professional landscaping, along with the newly painted porch and entryway. Imagine porch-front gatherings and relaxing in the front yard on those great Spring evenings!Walk into the lovely foyer and see stunning new white oak hardwood floors and natural light throughout. Enter into the living room adorned with a beautiful gas fireplace, which was just installed. The Chefs kitchen is outfitted with gorgeous new quartzite countertops, tons of cabinet space, and a perfect breakfast area. The expansive kitchen, overlooking the backyard, has brand new countertops, refrigerator, and sink. The grand dining room can easily accommodate an ideal dinner party. Finally on this level is a flex room perfect for a study, office, den, or family room, featuring custom built-ins. Walking upstairs you will find the Owners Suite, where you will see vaulted ceilings, oversized windows, and a well appointed ensuite bathroom with separate vanities. The three other spacious bedrooms on this level each are flooded with natural light and have ample closet space.The lower level is an amazing bonus to this home - complete with a large recreation room, new washer and dryer, a full bathroom, and another office/den. What makes this opportunity one that cannot be missed is the fabulous outdoor space - a sweeping deck right off the kitchen and dining room make for an entertainers dream - think dining al-fresco! The patio and professionally landscaped backyard are fabulous additions as well. You cant find anything better than this, with an expanded backyard double the size!, new sod, and a new fence, this backyard is truly an entertainers dream. Neighborhood restaurants, markets, and conveniences at your doorstep! Open Saturday, 12-2 pm Sunday, 1-3 pm! Welcome to the grand Penthouse of the Villas on 6th Street- luxury living in the heart of Shaw. The unit lives like a home, with 3 bedrooms, 3 bathrooms, and 2000 SQFT of stylish and sun-filled living area. Walking into the first level you will find 10+ ceilings throughout, wide plank white oak flooring, oversized windows, and recessed lighting. The gourmet kitchen is flanked with Bosch appliances, a Jenn Air 3 door refrigerator/freezer, quartz counters, and custom-made wall cabinets in natural wood. This chef~s kitchen is complete with a waterfall island with breakfast bar seatingEach bathroom features Porcelonosa tile and offset full-width mirrors with LED lighting. The expansive owner~s suite is outfitted with a spacious closet and barn doors leading to the spa-like ensuite bathroom. The private roof deck allows for one to have an oasis in the middle of the city, with sweeping city views and space to entertain, lounge, and more. This amazing opportunity also comes with secured off-street parkingIncredible location- live in the vibrant Shaw neighborhood near the finest dining, upscale shopping, and close to the METRO. An urban oasis situated in the heart of Park View. This stunning residence is anything but ordinary, offering refinement and sophistication with functional practicality. No stone was left unturned by this masterpiece, which was cultivated by the brain trust collaboration of DAKS WOD Development. Upon entering Unit A you know that you have ~arrived~! This is more than a home, it is a representation of style, thoughtful design and grand living. With over 2,400 square feet consisting of 4 bedrooms, a den, and 3.5 baths the functional usage is infinite. Timeless contemporary finishes coupled with custom touches assure that this dwelling will stand the test of time. The lower level, an in-law suite, affords a living area, full bathroom, and bedroom. The Owner~s suite offers an ingenious collapsable wall expanding the suite by nearly 100 square feet. In urban living, private outdoor space should be as thoughtfully executed as internal living space. This is exactly the case at 831 Rock Creek Church Road. Whether needing some fresh air, or entertaining a roof top party, there are FOUR outdoor living options! 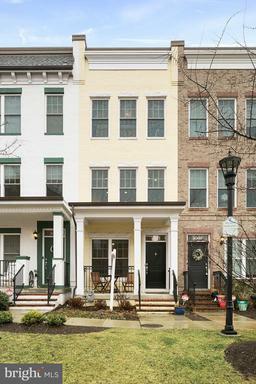 With only a half block walk to the Petworth METRO the City is literally at your doorstep. In addition to access you are only blocks to groceries, nightlife. and all of the dining options that the Georgia Ave corridor have to offer. Accepting back up offers, call to schedule tour. 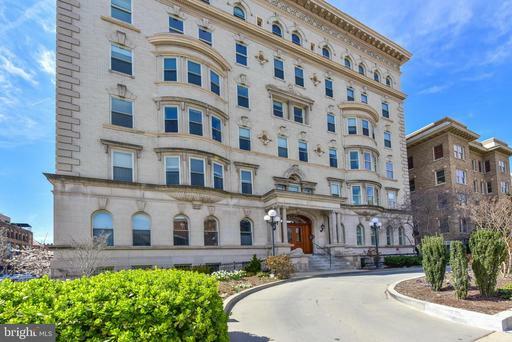 LUXURY PENTHOUSE in the heart of Columbia Heights ! 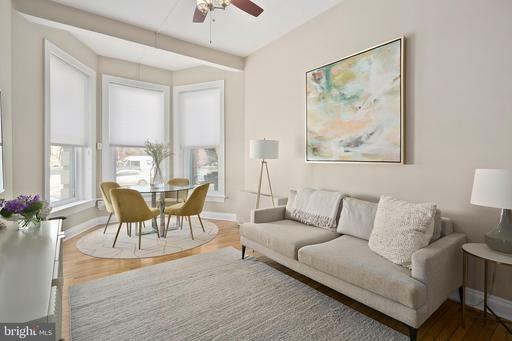 This exquisite 2BR/2BA home is comprised of the top three floors of a classic DC rowhouse and located on the corner of a beautiful tree-lined street. 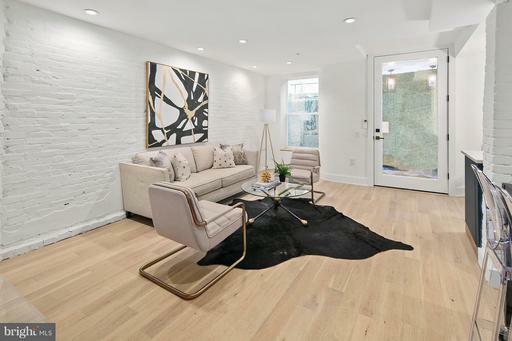 Upon entering the home, you are greeted by a gorgeous wall of masterfully restored exposed brick running the length of the entryway~s two-floor staircase. 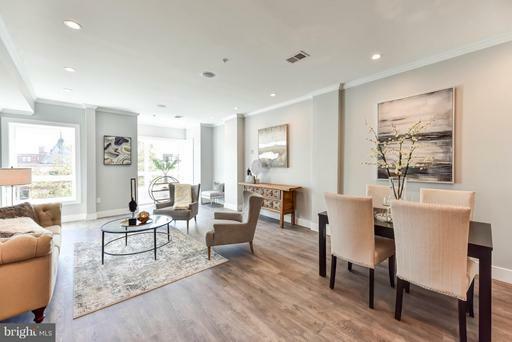 The living room features an open floor plan, 11-foot ceilings, a balcony with treetop views, and large windows flooding the unit with natural light from multiple exposures. 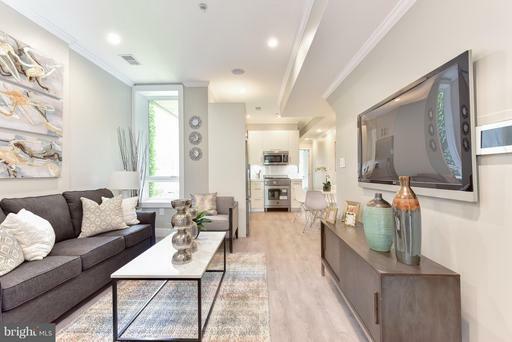 Built with entertaining in mind, this sun-drenched penthouse features a chef~s kitchen complete with top-of-the-line Bosch and Viking appliances, Carrara marble, a gorgeous bay window with deep windowsills and plenty of storage. The MBR boasts two spectacular skylights, ensuite marble bath, a walk-in closet featuring custom-designed Elfa shelving and a unique reading nook built into the home~s original turret. 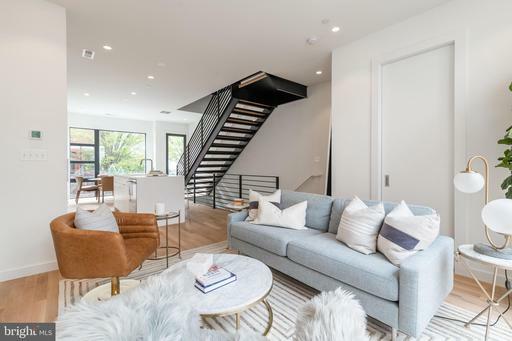 A staircase from the kitchen leads you to the home~s light-filled party room featuring a wet bar, wine fridge, U.S. Capitol views and glass patio doors that lead out onto an incredible private roofdeck complete with built-in outdoor speakers and magnificent city vistas. A separately deeded, well-lit parking space is located just behind the building. 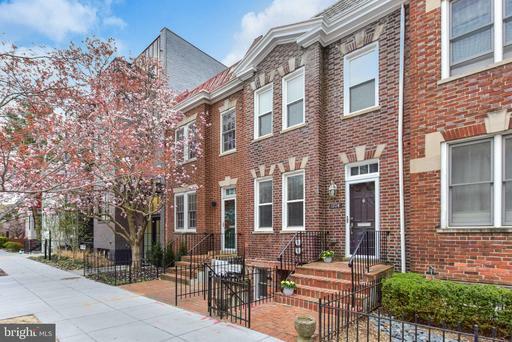 This home is perfectly situated in close proximity to four vibrant neighborhoods: Shaw, Adams Morgan, U Street and Columbia Heights. Located on multiple bus lines and near two metro stops, just a few blocks from The Line, a stylish new boutique hotel, Bad Saint, an award-winning restaurant, and the highly anticipated Whole Foods coming in next year on Florida Avenue! Classic Victorian bay-front home in coveted Lincoln Park location. Beautifully renovated with stunning period details throughout, including exposed brick hardwood floors, and lovely vaulted ceilings. The expansive living room is adorned with built in shelving and a wood burning fireplace. The living room leads right out to the deck and private backyard- an oasis in the middle of the city! Each spacious bedroom includes gracious closet space and ample natural light. The Owners Suite is stunning, with a bay-front nook and a stained glass window. A large dining room fit to host a dinner party features a second fireplace and leads into a family room- perfect for entertaining! The gourmet Chefs kitchen is outfitted with a stunning breakfast bar, top of the line stainless steel appliances, and gorgeous countertops. This home is situated in a premier location, moments to Eastern Market, Union Station, Lincoln Park, the new Whole Foods and Trader Joes! NEW PRICE! 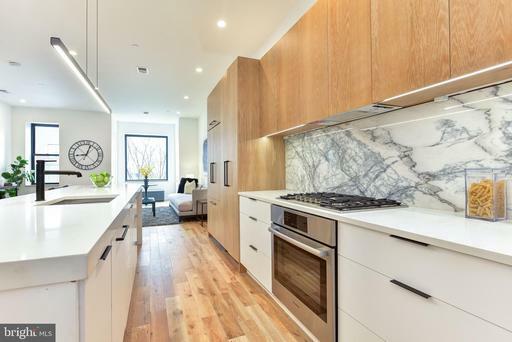 Luxury residences in incredible location- live in the middle of U St, 14th St Meridian Hill Park! 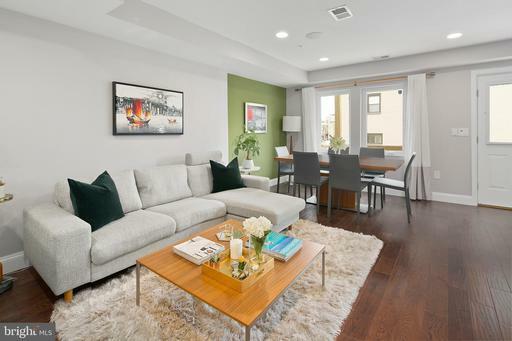 2BR/2BA with Porcelenosa contemporary finishes throughout. Living area with floor to ceiling windows oak flooring in French gray. Sleek kitchen with table space white marble counters. Luxe owners suite with ensuite BA double vanities. NEW PRICE Open Sun, 12-2 pm! LUXURY NEW CONSTRUCTION + Light + Location + Privacy + exclusive outdoor terrace makes this 2 bedroom/2 bath residence a DEAL. Parking available. The modern living and dining rooms feature exposed brick and impressive natural light. The oversized chef-designed kitchen is adorned with marble countertops and custom cabinetry. Each spacious "Master Suite" flows out to the privately deeded patio. The Cosmos has a common front courtyard featuring landscaped gardens and a limestone walkway. SUPERB LOCATION. Walking score of 97. Minutes to restaurants, Metro, shops and more! NEW PRICE! Open Sun, 1-3 pm! 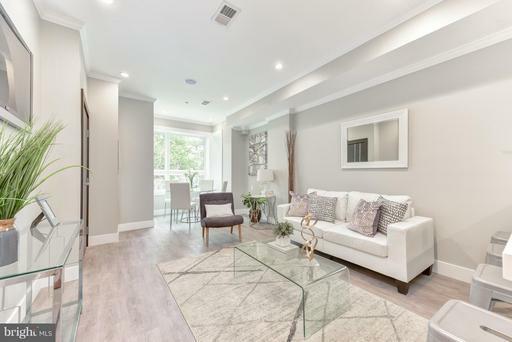 Luxury residences in incredible location- live in the middle of U St, 14th St Meridian Hill Park! 2BR/2BA with Porcelenosa and contemporary finishes throughout. Living area with floor to ceiling windows oak flooring in French gray. Sleek kitchen with table space white marble counters. Luxe owners suite with ensuite BA double vanities. Only 4 units remain!! 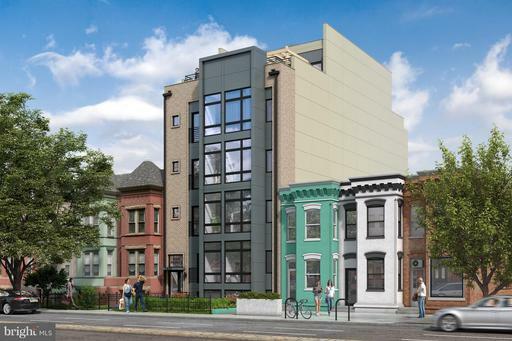 Five Points Flats is a new construction condominium located in the heart of DC in the centrally located between five of the hottest neighborhoods: Truxton Circle, Shaw, Bloomingdale, Eckington, and NoMa. Unit 201 is a premier 2 bedroom one bedroom with large den 2 bath unit with modern finishes throughout. The living area features floor-to-ceiling windows that fill the room with tons of natural light, along with space for a perfect dining nook. The open floor plan flows right into the chef-designed kitchen, which boasts quartz countertops, stainless steel appliances, gas cooking, large island, breakfast bar, custom cabinetry, and contemporary light fixtures. Gorgeous white oak wood floors throughout. Both bedrooms are spacious, with en-suite bath and large closets. Five Points Flats is pet-friendly, with NEST thermostats, bike storage, common lounge space, and secured entry. The building also features a large communal roof deck with Capitol and Monument views creating an oasis in the middle of the city. Secure, separately deeded parking available. New price Open Sunday, 4/21 from 1-3 pm! 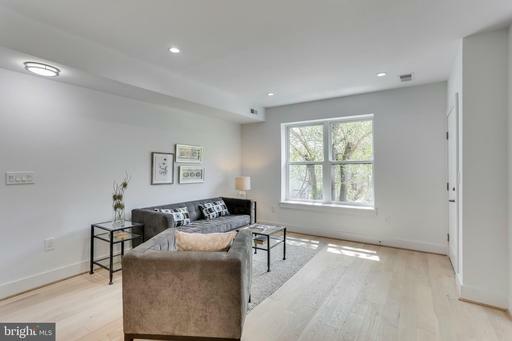 Turnkey premier new construction residence in Eckington with stylish details throughout. The bright and open living room is flooded with natural light and features hardwood floors and recessed lighting. The gourmet chefs kitchen is adorned with a top-of-the-line appliances including a perfect island, a French door refrigerator, and custom light fixtures. Each bedroom is extremely spacious with tons of natural light and gracious closet space. The bathrooms are outfitted with rain shower heads and stunning tile work and fixtures. Live with convenience at your doorstep, with the Rhode Island METRO, shops, and fantastic dining nearby. Low condo fees complete this amazing opportunity. Just reduced! 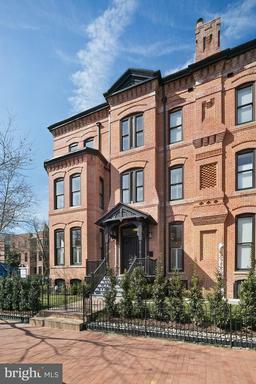 Luxury residences in incredible location- live in the middle of U St, 14th St Meridian Hill Park! 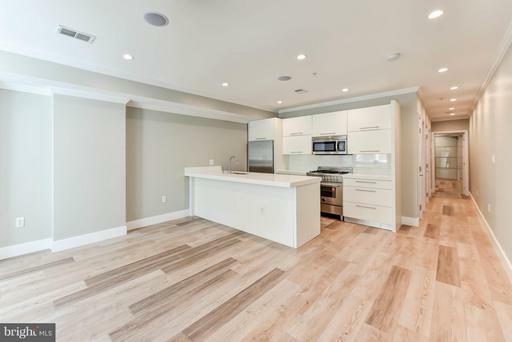 2BR/2BA with Porcelenosa contemporary finishes throughout. Living area with floor to ceiling windows oak flooring in French gray. Sleek kitchen with table space white marble counters. Luxe owners suite with ensuite BA double vanities. Secure parking available for $30k! 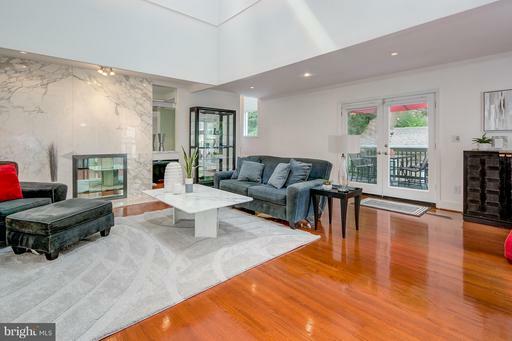 Live on the top floor in incredible 16th U Street location! Welcome to the Balfour, an amazing building that allows you to live in the heart of vibrant DC. 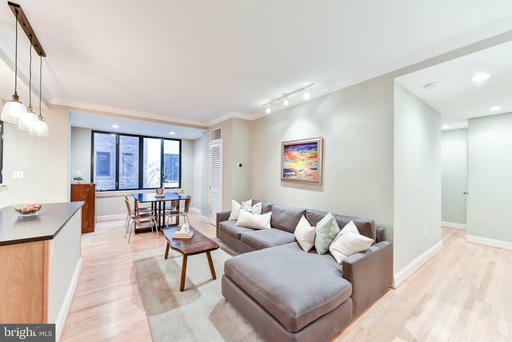 This beautiful condo features wood floors, a wood burning fire place, and stunning built-ins. The gourmet kitchen has a great breakfast bar and tons of counter space and cabinets. 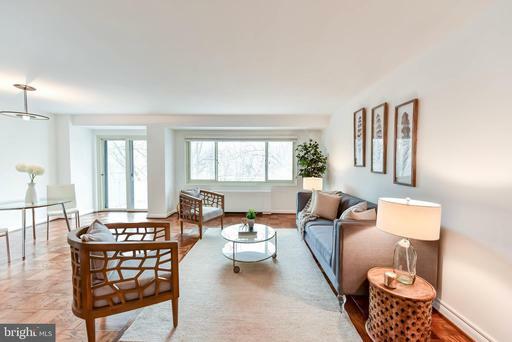 The sun-drenched living room has space for a dining table and oversized windows with sweeping DC city views! The spacious bedroom is complete with expansive closets and tons of natural light. The stacked washer and dryer in the unit and the extra storage top off this fantastic opportunity. 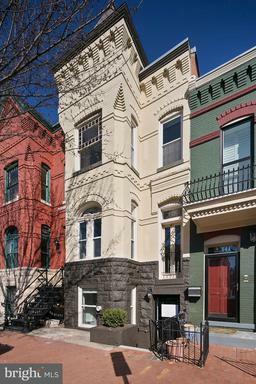 This location cannot be beat, with U Street, Dupont Circle, and Adams Morgan right at your doorstep. You have the trendiest shops, DCs finest restaurants, and an incredible social scene at the palm of your hands at the Balfour. 3 blocks to the U Street Metro and Yes Organic and 6 blocks to Harris Teeter and Dupont METRO. Walk Score 94/100 - "Walkers Paradise"! Rare opportunity to purchase an Affordable Dwelling Unit in Chancellors Row! Chancellors Row is a newly constructed LEED-certified development built in 2012. This spacious and bright home is an amazing value and opportunity to live in this incredible community. Walking into this porch-front home, you will see the first bedroom- a great guest room, office, and more. The living room has tons of natural light throughout, along with gorgeous wood floors and recessed lighting. This flows right into the dining area and gourmet kitchen, an entertainer~s dream layout!The kitchen is outfitted with premium counters, expansive counterspace, tons of cabinets, and a perfect breakfast bar.The Owners Suite upstairs has gracious closet space and an ensuite bathroom with separate vanities. Finally, the attached garage parking completes this home. This home is income restricted ADU. There must be at least three household persons up to 8. Document regarding the maximum income attached- use the 80% column with household size 3 to 8. Please contact agent for details and requirements.